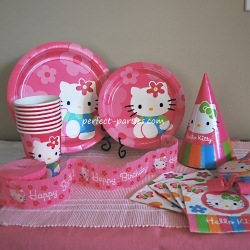 Hello Kitty Party Ideas for Kids. This is such a cute theme with so many cute decorations, favors and accessories! Dress up with Hello Kitty outfits, t-shirts, dresses and more. Wear Hello Kitty earrings, ponytail holders, glasses, socks, shoes and more to accessorize your outfit. Decorations and favors are available at Crafts Stores like Michaels, Target Dollar Section. eBay is another source for Hello Kitty items. Be sure to check date of delivery since many of these vendors are based in Hong Kong. Price vendors for best shipping and good ratings. Target has a nice selection of Hello Kitty items in the dollar section making it great goody bag fillers and small prizes. They have bags, tins, markers, tablets, socks, stickers, color books and pencil cases. There are also the full price Sanrio stores that have larger items and an extensive collection of items. Macy's has some Hello Kitty clothes and outfits. Use those 20% off coupons and get great deals! You can find cute sets from Etsy to use for invitations, thank you notes and more. There are cute outfits, shirts from Macy's or Sanrio Stores, a few choices from Amazon and Target stores. Hello Kitty crepe paper streamers. Pink or white tablecloth. White will show off colorful decorations nicely. Colorful character balloons. Tie to birthday girl's chair or decorate the room. Hello Kitty buckets/pails to hold cutlery. Cute cups filled with goodies like a jumprope, tattoo and ring pop made this a cute easy to assemble party favor. Hello Kitty bags (see photo) They have $1 Hello Kitty bags similar material to reusable shopping bags with a cute picture of Hello Kitty on the front. These are perfect for holding party favors and it's reusable. 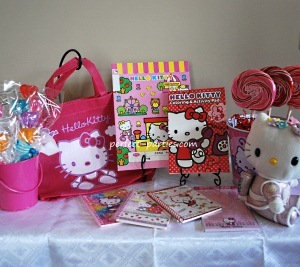 Hello Kitty Metal Pails filled with Hello Kitty favors, colorful lollipops, pencils and markers. These can be found often at Target and are great as reusable pencil and marker holders for kids. Hello Kitty Stuffed animals come in all sizes and outfits. Veggie platter with baby carrots, cucumbers and celery. Fruit Dip with cut fruit. Put food in Hello Kitty containers and on dishes to make it theme related...then you can pick almost anything! These are easy to find at many local stores, eBay and online hello kitty party sources. Melt and pour soap is a simple soap making activity that makes this a useful make and take. Click on the picture for more details. Decoupage a small pot, jar, or container to make a cute make and take. These pots come in all sizes and you can fill with small goodies like Hello Kitty pencils and erasers and small treats. For full instructions click on the picture. Hello Kitty Pinata's are available from various sources. Use a pinata blindfold, bandana or large hat.